November 15, 2018 | Filed under: Current Articles,Featured | Posted by: Alex A. The past three years have been a whirlwind of excitement for 17 year-old Caroline Bradley of Lubbock, Texas. 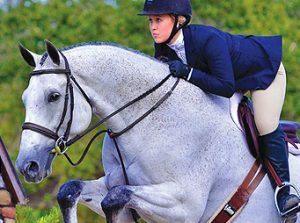 Although she has always loved horses and ridden since the age of five, the daughter of Dr. Jason Bradley and his wife, Anne, was so green to big-time showing that when she won her first significant title, an AQHA Level 1 Championship in Youth Working Hunter with Envy This One in 2015, she didn’t even know what a victory lap was. Since then, she has become quite accustomed to that time-honored tradition and is racking up even more titles. In 2016, Caroline won Level 2 second place titles in Youth Working Hunter and Youth Equitation Over Fences. She was also the 2017 All American Quarter Horse Congress Champion in Youth Hunter Hack 14-18. She was the 2017 Reserve World Champion in Youth Equitation Over Fences at the NSBA World Show and holds the Reserve NSBA Champion Year End award in Youth Hunter Hack. This past summer, she won Level 2 Working Hunter at the AQHA Youth World and finished with Top Ten finishes in all Level 3 Over Fence classes with two different horses.